← Which blog posts most interested my readers in 2014? How can people who do not love God be considered not to be sinning? I started to write a response to Chris’s question in the comment thread, but it became too extensive for that venue, and so I decided it would be best to make my remarks in the form of a follow up blog post, thereby making them available much more widely and perhaps increasing the likelihood that something helpful might result from conversation. Here is my initial attempt at a reply. That is an excellent question, Chris. If you have read later posts from me, you know that I did eventually conclude that Scripture teaches that God will ultimately destroy the wicked. In the post which prompted your question, I had proposed how an annihilationist might appropriate the insights of “reconciliationism,” and I am now in the position where I have done so. It seems most likely to me that in addition to being retributively punitive, the suffering of the wicked in the after life aims at the subjugation of their rebellious wills. As Bawulski has described the situation, that subjugation is not a form of repentance which brings about salvation, as universalists believe. It is an acknowledgment that Jesus is Lord; it has no joy or praise in it, but it is a cessation of resistance and rebellion. I now posit that it is likely that the moment at which a sinner reaches that point, having been justly punished for the sins done on earth, and having quit denying that Jesus is Lord, is the time at which God’s purposes for their conscious punishment have been achieved. He then withdraws from them, as a final act of judgment, his sustenance of their life. From an annihilationist perspective, then, I think that a good answer to your question is forthcoming. The frustrated submission of sinners’ wills to the truth that God is indeed Lord of all gives God a measure of satisfaction but it is certainly not equivalent to the love for God which God graciously gives to the redeemed. Such love is, however, beyond the capability of the unmitigatedly unrepentant wicked and is therefore not their moral obligation. Beyond that point, no reason remains for keeping the wicked alive, so they die the second death and are destroyed in body and soul (Mt 10:28). I am assuming that you are a traditionalist, and so I’ll endeavor to speak to your question from within that perspective. I confess that it is not easy for me to do this in a way that seems thoroughly satisfactory to me, and I am thinking that you have possibly put your finger on an entailment of the traditional view of hell that would move a person in the direction of annihilationism. Nonetheless, here are some further thoughts. 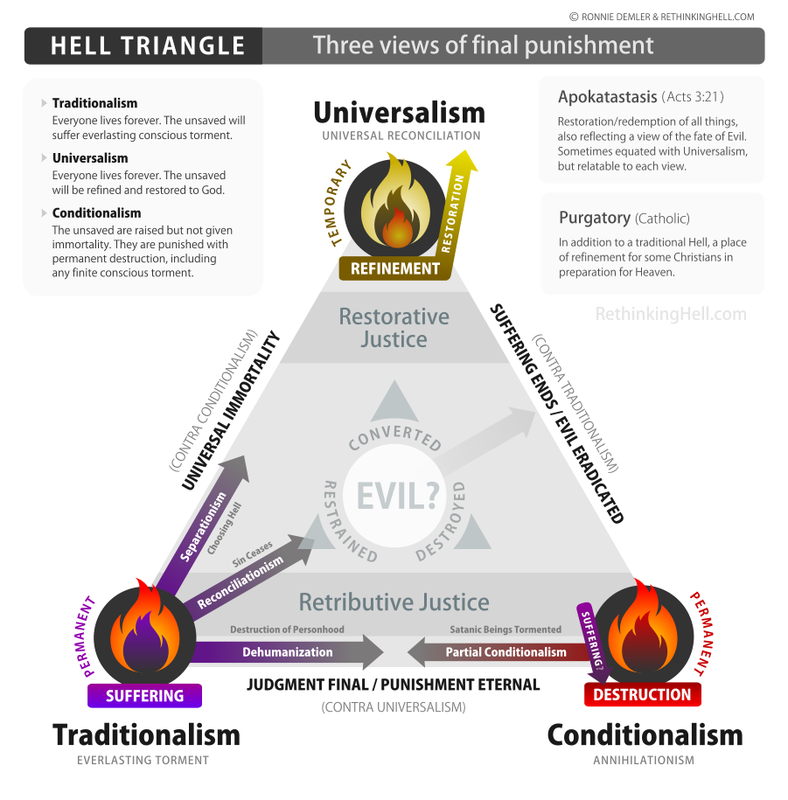 Below is a very helpful triangle developed by the folks at Rethinking Hell. It splendidly depicts the alternative understandings of hell which are currently being proposed. You’ll notice an arrow moving from traditionalism toward annihilationism (which they call “conditionalism”). It is labelled “dehumanization,” and it is an option that I encounter fairly frequently these days in reading or speaking with traditionalist evangelicals. That perspective would probably provide the most helpful framework within which to explain why sinners in hell eventually cease to sin, even though they do not love God with all their hearts, souls, minds, and strength, nor their neighbors as themselves. Parenthetically, I wonder: will there even be “neighbors” in hell? Recently, it has occurred to me that in a place where sin is unrestrained, social relationships would be impossible, so that the residents of hell would all be living in something akin to solitary confinement. Narcissism would be so total, that even if others were around, individuals would be completely wrapped up in their self obsession. Coming back to “dehumanization,” it seems to me that the hollowing out of human personhood by complete abandonment to sin would make love totally impossible. Christian ethics has always maintained that one is not morally accountable for something unwilled. Perhaps, sinners in hell who finally bow their knee to Jesus will find it to be an act so awful that it will drive them “out of their senses” into total madness. In such a state a person would be without conscience and without moral accountability. I’m speculating here, Chris, not speaking with any strong certainty. As I said, I find the cessation of sin in hell not a problem, if God finally destroys the wicked, as I believe he will. But if I were pondering the question you have raised from within a traditionalist framework, I would venture something like I have suggested here. I welcome comments and better proposals. This entry was posted in Eschatology, Ethics and tagged annihilationism, hell, sin, traditionalism. Bookmark the permalink. 6 Responses to How can people who do not love God be considered not to be sinning? Hi Terry. I always appreciate your clear thinking and your godly, gracious approach. I was not actually realizing that you had come to the annihilationist position when I asked the question. It seems to me that the annihilationist position has an easy answer to the problem that I was pointing to – i.e. : of how the reprobate can come to the point of having “no more sin” and yet also not be “loving God.” In eternity (the annihilationist believes) reprobate people cease to exist; therefore they don’t sin, but they also don’t love God. I don’t think that it is necessary to speculate, in the annihilationist position, that there is a temporary point in which the rebrobate person “doesn’t sin” but yet also “doesn’t love God.” It seems that you either need to suppose that their moral-accountability is briefly annihilated, before their existence is annihilated, or else you need to accept that they continue to exist in a sinful/guilty state until the point of their annihilation. 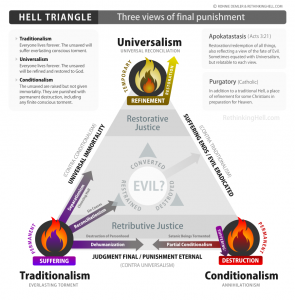 I myself do affirm a traditionalist understanding of eternal punishment. It seems to me that I must accept, by the logic of this position, that reprobate people must continue to exist in a sinful / displeasing-to-God condition for all eternity, not loving God, not loving other humans (either in heaven or hell) – and yet something does change (compared to their condition prior to the judgment). What changes, I suppose, is not that God stops being good to the reprobate. His goodness is constant unto all, and it is His goodness which keeps the reprobate existing. What changes, I suppose, is (first) that the reprobate person willingly and openly acknowledges that Jesus is the Lord, to the glory of God the Father (and they will forever acknowledge this truth). Furthermore, what changes is that God consigns the reprobate to a condition in which there is utter darkness and no more temporal enjoyment of His common grace; but rather, a clear vision of how they have been guilty of whatever degree of ingratitude and rebellion. I assume this is a kind of solitary confinement, in which there is no more enjoyment of personal sin, no more sinful influences from one sinner to another, and no more situations in which one sinner can harm another sinner, or tempt another sinner, or delude another person regarding the goodness of God (or His good will). No reprobate person will ever serve as a tempter of a citizen of New Jerusalem, nor will they conspire together against the Lord or His people. Sin will still exist as a category, since those reprobate people will continue to exist forever (and they will be “sinners,” by definition, seeing that they do not love God or love other humans – and God’s Law does not change). But sin will no longer be existing in the realm of the redeemed. Sin will only be an “out there” reality, from the perspective of God and of His redeemed people. And even in that place of outer darkness, sin will not reign, since the reprobate will be isolated and without power, in their everlasting state of subjection. I don’t see how anything in this view, expressed above, would lead me down an annihilationist road. But I am curious: Can you can see a point of tension in my position that I don’t see myself? I don’t see tension within your position, Chris. It sounds very coherent to me. In your case, the question is therefore purely exegetical: does Scripture teach that God keeps sinners alive forever in hell, so that they remain forever consciously aware of God’s wrath upon them as sinners? I came to believe that the idea that God gives eternal (in the sense of endless) life to the wicked is contrary to Scripture, which clearly speaks of eternal life and of immortality as God’s gift to the redeemed and, in an overwhelming preponderance of references to the wicked, speaks of their fate as death, destruction, perishing, and ruin. The wicked are cut off from the privilege of eating of the fruit of the tree of life, and yet traditionalism asserts that God miraculously keeps them alive. I don’t hear that being taught in Scripture, and the nuancing of “eternal life,” which I used to find satisfying in explaining why the wicked also live eternally, no longer seems required by Scripture’s clear statement of what God does to the wicked. This allows for a much more natural understanding of life and immortality. In this life, people choose whether they will live or die in the new world that God brings about in the consummation of his purposes for his creation. Excellent post, Dr. Tiessen. This “dehumanization” view, like that seemingly held by N.T. Wright, is something I find very interesting. I think, however, that this view just serves to further show the superiority of the annihilationist proposal. Can we rightly call the “dehumanization” perspective “eternal conscious torment”? It seems difficult to do sincerely. If the unrepentant sinners eventually became something so entirely corrupt and “inhuman” (like some mad dog with rabies), I doubt we could really say they were “conscious”–at least in the way we are used to using that word (e.g. in their right mind, fully awake, aware, etc.). Steven, perhaps the traditionalists who perceive hell as a place in which the wicked are gradually dehumanized have something less drastic in mind than I have portrayed. I sympathize with your sense that it is problematic to combine the affirmation of ECT with a thoroughgoing dehumanization. It seems to me that the essence of eternal conscious torment is that the same persons are continuously conscious of suffering God’s punishment for their sins. But thoroughgoing dehumanization looks to me to have so depersonalized a sinner that it is no longer the same being who suffers. What keeps some proponents of dehumanization from asserting dehumanization as an alternative to ECT, if not actual annihilation, is affiliation with a church or organization that has a creed or statement of faith that explicitly affirms eternal conscious punishment of the wicked. I can’t seem to get the blog post after this one, “A helpful resource on hypothetical universalism,” to load. Do you know if there is a problem with the link? Thanks, Steven. There was a problem. I couldn’t amend it so I deleted the old post and republished the material in a new one.